The extra fire hazards around the home at Christmas have been outlined by Oxfordshire County Council's Fire and Rescue Service. 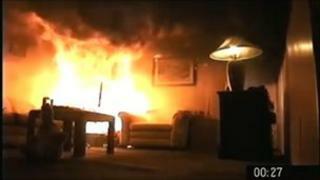 Candles, decorative lights and home cooking all mean there is an increased chance of fire in the festive period. Their warning coincides with the release of a short government film which shows a Christmas tree fire destroying a living room in a minute. The campaign warns people to turn off tree lights and not to overload plugs. Their "12 days of Christmas safety tips" include checking on elderly relatives and neighbours to make sure they are safe and also to avoid drink driving. Stuart Garner, Oxfordshire Fire and Rescue Service, said: "Never drive if there's even a slim chance you are still under the influence." All of their tips can be found on their website 365alive.